Mental Health Clinicians at Kaiser on Strike! Today, January 12, is the first day of a week-long strike by over 2,600 therapists, psychologists and psychiatric nurses at Kaiser facilities in California. The strike is to protest Kaiser’s inaction in the face of huge failures in its mental health services, including delayed care. Kaiser members suffering from mental illness must often wait for several weeks to see a therapist. In 2013, the Department of Managed Healthcare levied a $4 million fine against Kaiser for its delays in providing the mental healthcare Kaiser members need. Late last year, Kaiser finally conceded to paying the fine, an implicit acknowledgement of the problems with its provision of mental healthcare. Mental health clinicians point to severe understaffing as the primary reason for these delays in providing mental health care. 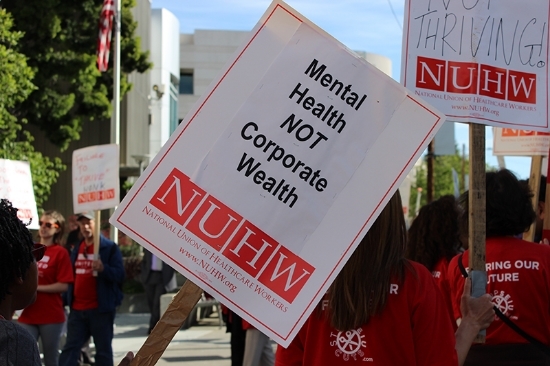 Joining the mental health workers are about 700 other Kaiser workers, also represented by the National Union of Healthcare Workers. They include optical workers in northern California and medical social workers, speech pathologists, health educators, audiologists, and dieticians, who also criticize Kaiser about issues related to short staffing. The strike will last all week, with picket lines will be up at 35 Kaiser facilities. Many news outlets have covered the strike. To stay up to date and to show your support, visit the NUHW website. Also see an article in the San Jose Mercury News. This entry was posted in Kaiser Permanente on January 12, 2015 by The Kaiser Patient Advocate.